Hey there! I was lucky to have some extra crafty time this week and felt inspired by the Simon Says Stamp Monday Challenge "Winter Blues"... Take a quick look at what I made... I hope you like it! 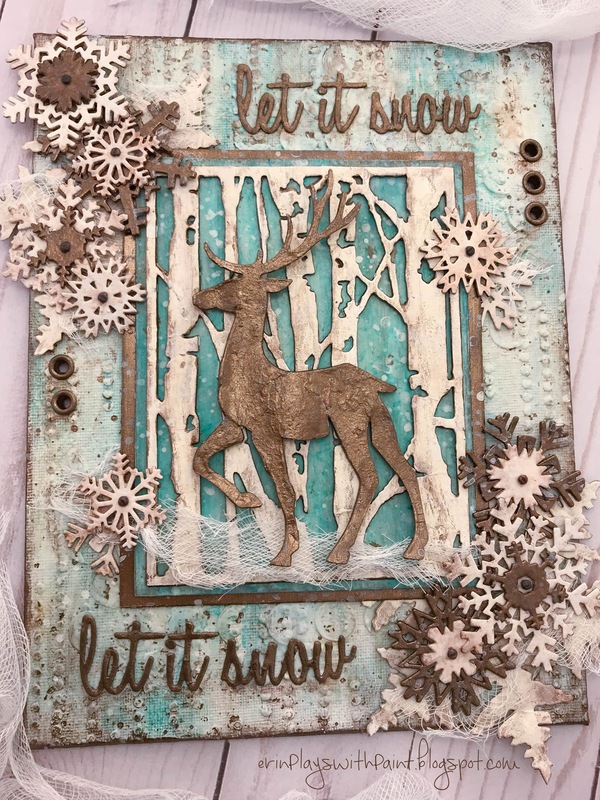 I used Tim Holtz water color paper, glued three sheets together, covered in gesso, then covered with Peacock Feathers Distress Ink. I painted the sides with the Rich Espresso, adding a few random flecks to the front to show between the trees. I knew I wanted to splatter white for snow as one of the last steps. I used Tim's Birch Trees thinlit die, cut 4 shapes and glued together. Then I covered with gesso, Antique Linen Distress paint, and Rich Espresso on all of the edges (getting back into all the little crevices was a bit time-consuming, but it helps this layer really pop!). 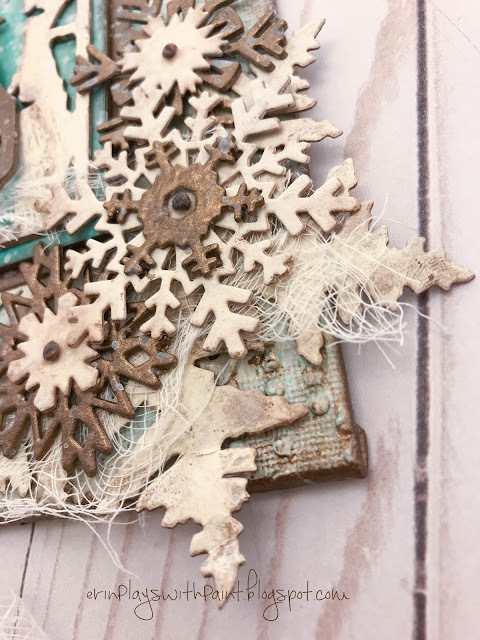 I knew these needed to be thick to really add to the overall dimension, so I cut several of each shape from Tim's Paper Snowflakes, Mini thinlit set out of heavy white cardstock and glued together... then covered each with gesso to give them that extra strength. 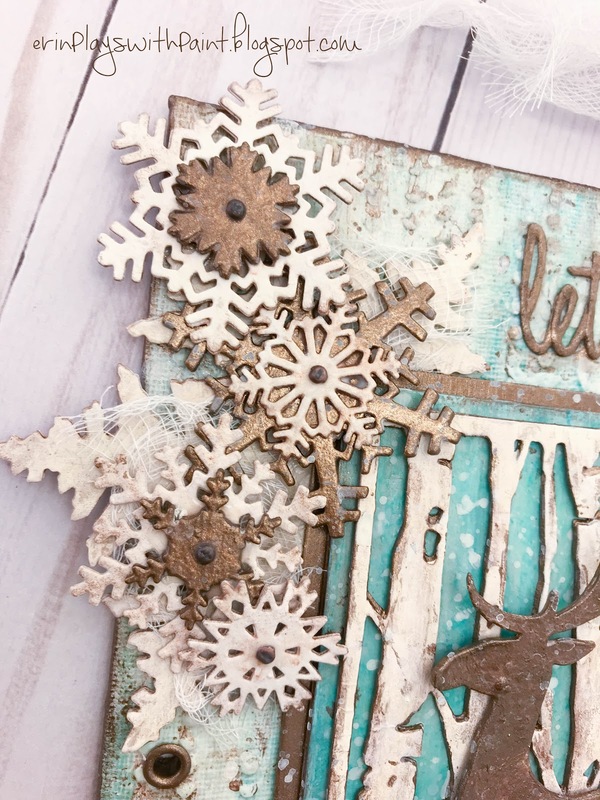 I did the same with the large Layered Snowflake die. Once I knew roughly where my snowflakes would go (changed my mind on this right up to the end! ), I picked which ones would be each color or wash. I used Tim's alphabet thinlit die, one shape of each letter cut from heavy white cardstock, painted with gesso, then the Rich Espresso metallic paint. I decided I wanted to add a few eyelets, but not in the traditional corners... I painted them with Rich Espresso and used my Crop-A-Dile tool to set, then smudged some metallic around them on the canvas to grunge them up a bit. I added a Tim Holtz Mini Fasteners to the center of each snowflake, and splattered Antique Linen Distress Paint over everything. 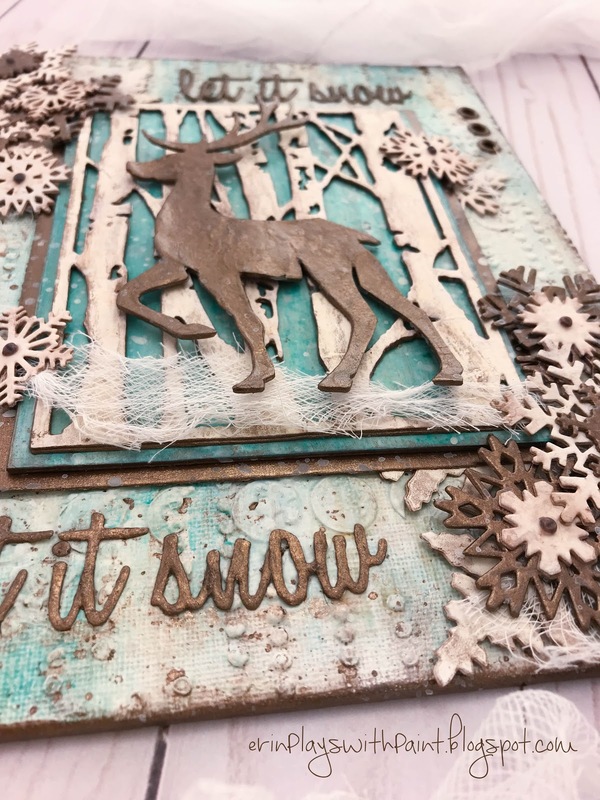 UPDATE: I was one of the lucky winners of the "Winter Blues" Monday Challenge on the Simon Says Stamp Blog! So excited to be featured among such an amazing collection of entries! I hope you have a great week ahead... Thanks for looking! Omigosh, that's gorgeous Erin! Really love how your project turned out. My jaw is sitting in my lap. This is STUNNING!! Wow, all the texture, layers, and soft colors! Wow!